Welcome to Roanoke Moose Family Center 284’s website. Keep an eye on this page as we post upcoming news and events. You can also subscribe to receive emails when new posts are published. In addition, we invite you to sign up for the 284 connection, a weekly e-newsletter detailing everything that’s happening at Roanoke Moose Family Center 284 in the coming weeks. On Saturday, May 20th we welcome the 3rd Annual Jesse Carper Memorial Fundraising Event. This is an OPEN TO THE PUBLIC benefit concert featuring Gabe Dixon & Whiskey River and Blue Connection with proceeds going to Craig County’s “Hooked on Fishing” program for children 3-15 of age. Please click here for a Printable Information Sheet about this event. 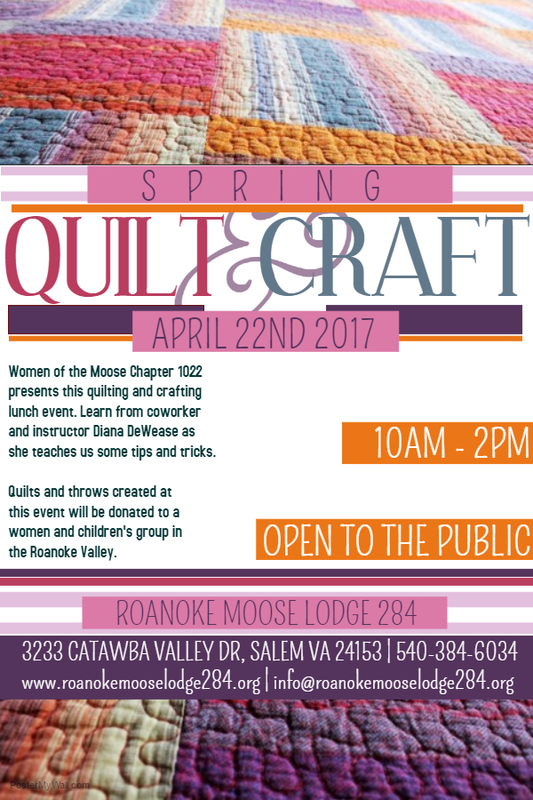 You are invited to attend a social event of quilting and crafts. Join us as we meet, greet, quilt, and for some, learn to sew and craft for someone in need of a gift. The fruits of this community service project will be donated to a local women and children’s group. Below is a list of supplies needed. For those who don’t already have quilting supplies, extra supplies of fabric, quilt batting, sewing machines, etc. will be made available. You must RSVP by April 18 for work space (and supplies if needed). Finished quilts, throws, crocheted or knitted donations are welcomed. A light lunch will be served. Roanoke Moose Family Center 284 is proud to host this Memorial Fundraiser Spaghetti Dinner on February 4th for Dennis Smith, organized by the Catawba Valley Abate Chapter. Suggested donation for spaghetti is $5.00 per plate (dine in or carry out) and there will be additional fundraising as well. All proceeds will go toward paying Dennis’ medical and funeral expenses. Please visit the gofundme page if you are unable to attend this dinner event but would like to donate toward Dennis’ expenses. Wow! What a great turnout for the Dennis Smith dinner! It always fills us with pride when we can help not only our neighbors in the community, but also our fellow Lodge members. Thank you to all who participated in the Memorial Spaghetti Dinner for Dennis Smith. The Catawba Valley Abate Chapter raised more than $2,500 for Dennis Smith’s medical and funeral expenses. Thank you to the Spences and Blue Connection for all the effort they put into the event. 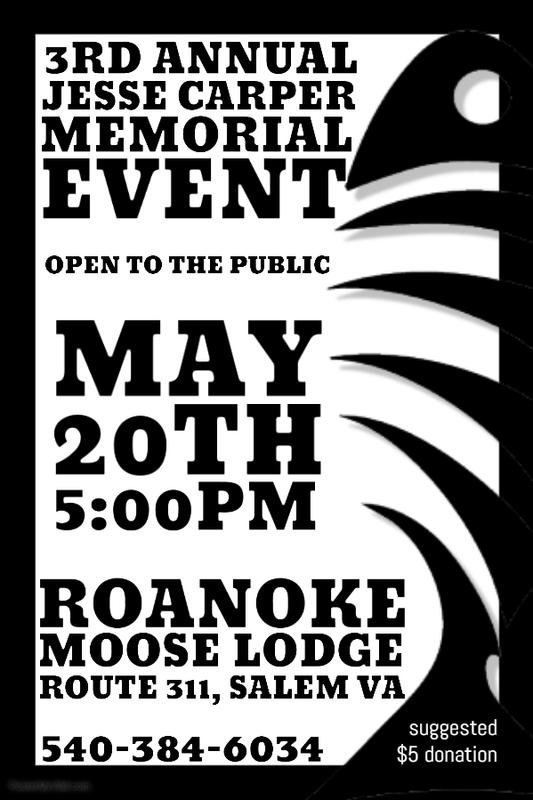 Roanoke Moose Lodge and Family Center 284 is an ideal venue for fundraising events such as this. With our grand event hall with capacity of 500-1000 people, supported by a fully-equipped commercial-grade kitchen, we can help you with your next fundraising event. Contact 540-384-7172 for more information. Merry Grinchmas! More than 50 kids had a grand time playing all kinds of games and activities. With more adults than kids we had more than 200 family and community members join in the festivities! I want to THANK everyone that helped with the Kids GrinchMAS party on Sunday. It was an overwhelming success. We had 51+ children, plus parents, plus the Moose members that helped with games, pictures, food, registration, etc. There was a lot of work behind the scenes that I owe a very special thank you to them as well. Also thank you to everyone that came and brought your children. I hope that the party was as much fun for them as it was for us at the Moose. Merry Christmas and Happy New Year! This event is open to the public, so please join us for the festivities. These are general opening hours. Please consult the event calendar for closure information.